That’s what I was going to say. F2 generation. Do you ever answer the Q? I though the yak-X was interesting but the photos I found have the f1 very furry. Is it a beefalo (buffalo x domestic cow)? 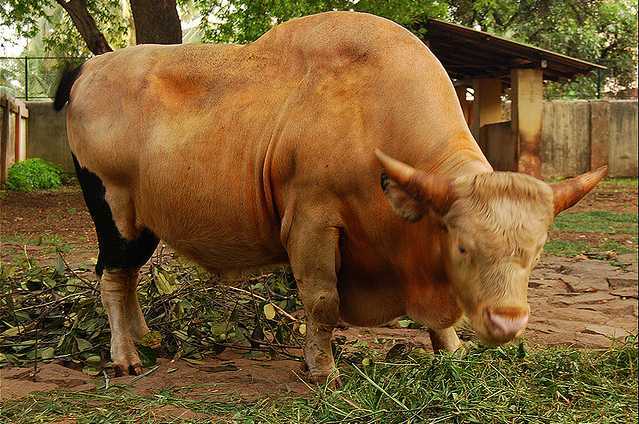 Looks like an oddly-colored gaur to me–http://www.ligerworld.com/liger-vs-gaur.html gives a pretty good outline of a mature animal. Horn difference could be crossbreeding or youth, though the outward tilt of the horns does suggest crossbreed. No idea…and I ain’t getting in there to feed it!!! It’s actually a domestic animal and is known for being very docile– more so than most domestic cattle from that region.